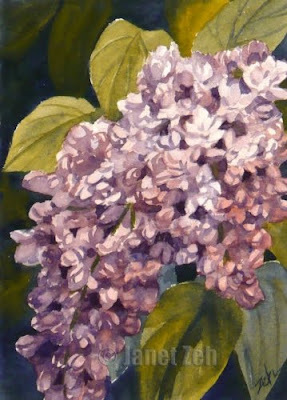 I've been so much in the mood to paint lilacs lately. It must be Spring in the air! These are beautiful double lilacs that bloom by the side of my house. They are a pinker color than common lilacs and have a wonderful fragrance. Mmmm...can't you almost smell it? In this painting, the buds are just opening. This 5"x7" watercolor painting is done using a limited palette of three colors, a red, a yellow and a blue. See my artwork for sale at zehoriginalart.com. Thanks for your visit and have a beautiful day.